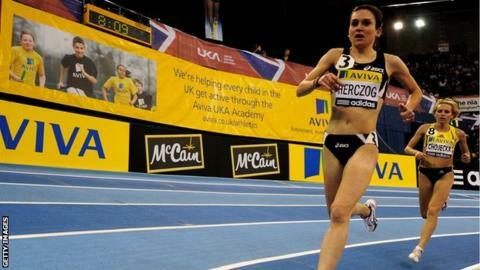 Netherlands cross country runner Adrienne Herzog has been banned for two years after failing a doping test. An out-of-competition test proved positive in March 2014 and her suspension runs until 14 May 2016. Herzog, who won bronze medals at the European Cross Country Championships in 2009 and 2012, protests her innocence. "The past 10 months have been the most difficult of my life, as I have never knowingly taken any banned substance," said Herzog, 29, on her website. "I did everything I could to try to prove this fact, and submitted detailed evidence to the hearing panel to prove that my positive test was due to a mistake and that I did not ever use any banned substances. "Unfortunately, that evidence appears to have been ignored. I will return to racing when my suspension ends, and I will be successful when I return."